Larger views of paintings from Provence that are on sale here. 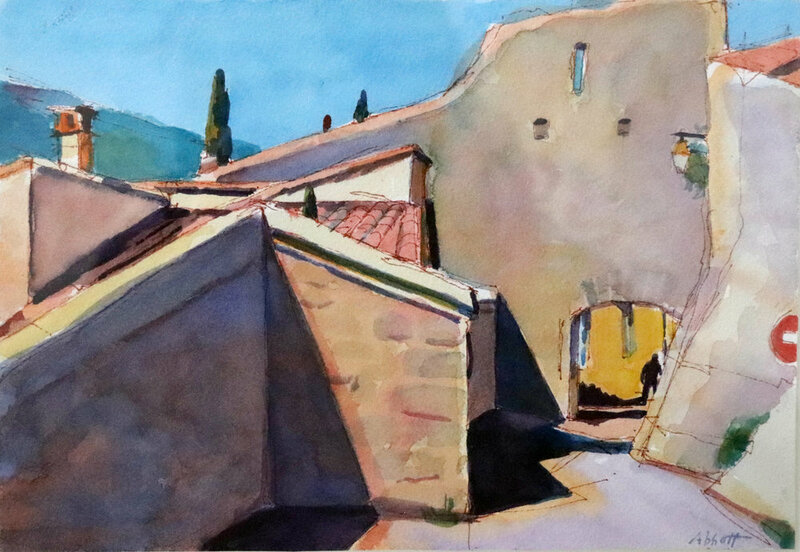 "Farmhouse and Fields, Provence", watercolor, 11” x 13”, framed in gold 18” x 20”, $300.00. Purchase here. “Clouds Over Lavender”, watercolor, 10” x 10”, framed in maple 20” x 20”. Purchase here. "Sudden Storm Over the Luberons", watercolor, 12” x 12”, framed in gold 15” x 15”, $290.00. Purchase here. "Looking Into the Valley", watercolor, 9” x 15”, framed in maple 19” x 25””, $400.00 Purchase here. “Dusk from Les Bassacs”, watercolor, 8” x 10””, framed in gold. Purchase here. 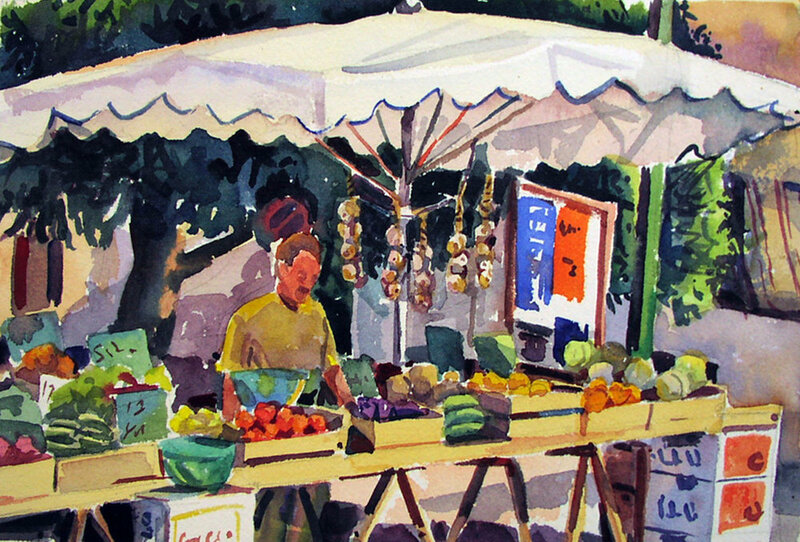 “Market Stall, Provence", watercolor, 9” x 12”, framed in maple 17” x 19, $250.00. Purchase here. "Bonnieux Walls", watercolor, 7” x 10”, framed in gold 15” x 18”, $275. Purchase here. "Fabric Stall, L'Isle Sur La Sorgue", watercolor, 10” x 13”, 350.00 Note: this painting floated in an 18” x 24” ivory archival matte rather than framed. 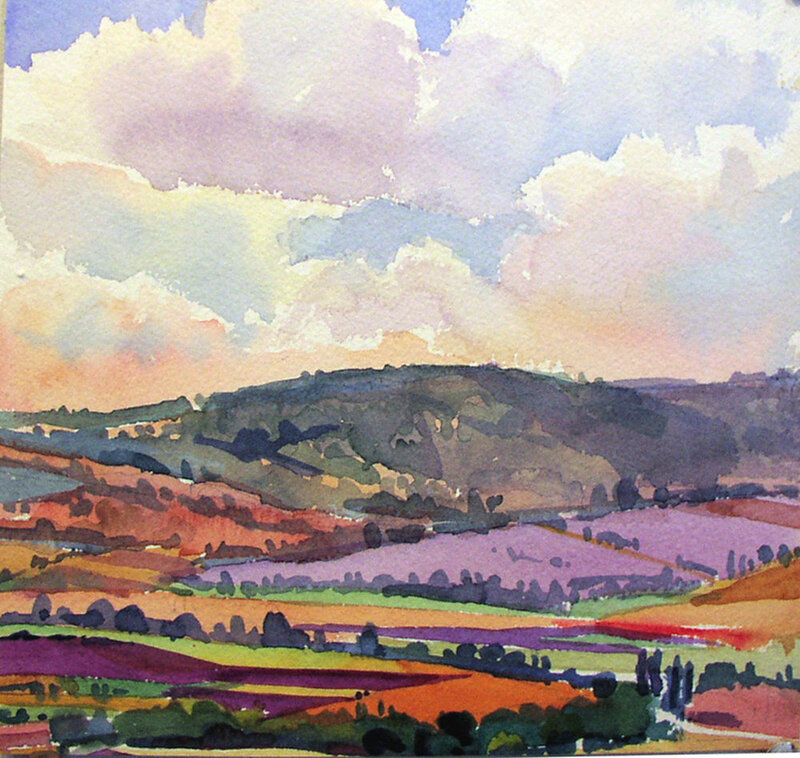 "Fields Near Gordes", watercolor, 14” x 20”, framed in maple 25” x 29”, $450.00. Purchase here. "Woman in the Apt Market", watercolor, 16” x 12”, framed in maple 24” x 19”, 450.00. Purchase here.